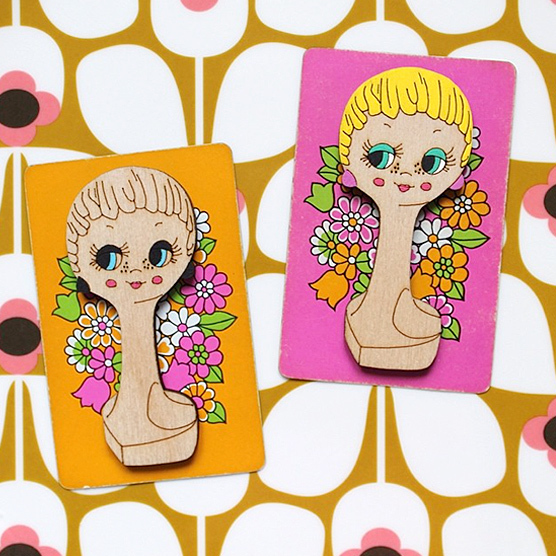 Each Twiggy brooch is carefully laser cut to my design and specification onto birch plywood, then hand painted by myself in the original colours from each decade before being sealed. Each piece is a wonderful piece of retro jewellery or as I like to think of them, a unique piece of wearable art. I adore the cross stitch patterns you design which can be found on the Kitschy Digitals website. What is it about the medium of cross stitch that you like so much and how can beginners get started? I adore cross stitch for a number of reasons, but mainly because I have had a lifelong love for surface design and vintage patterns! I’m not quite sure what it is about the process but I suspect is has a lot to do with designing patterns that I can then marvel at in beautiful cross stitch form. I often get lost for hours drawing in my sketchbooks, so it just felt right for me to translate those patterns into cross stitch for others to enjoy also! 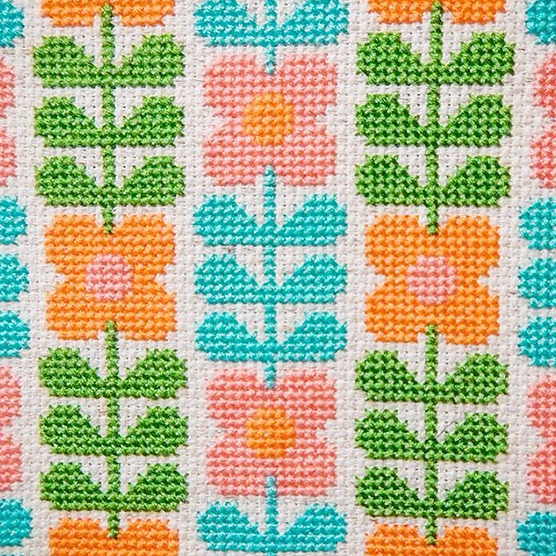 All my cross stitch patterns are inspired by the floral or scandi designs found on fabric and wallpaper of the 1960’s/70’s and all are beginner friendly. All you need to do is purchase one of my downloadable patterns from the Kitschy Digitals website, buy some aida fabric, pick your thread colours and start stitching! It’s as easy as that and before you know it, you’ll be hanging your finished retro handy work on the walls next to your vintage paintings and prints! As a great enthusiast of vintage crafts I decided to base my downloadable range on the forgotten art forms that I enjoyed so much in my childhood. My cross stitch patterns are just the first in a series of those genres and I’ve recently been working on a range of downloadable 3 in 1 paint by numbers sets based on those of the early 1970’s, which I hope to have finished and listed on Kitschy Digitals very soon! 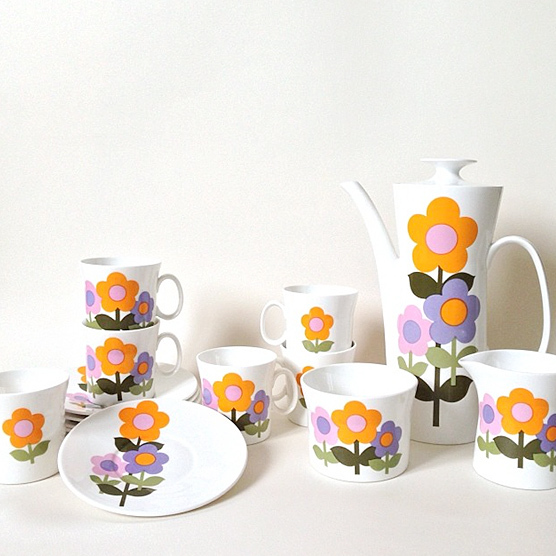 Superb set of Dolly Days Hostess Tableware. You love to thrift for vintage treasures and this coffee set is a triumphant find! Where do you go to thrift and what kinda thing do you look for? I love hunting for vintage treasure and was delighted when I finally completed my set of Dolly Days Hostess Tableware, that’s pictured here! I love looking for a variety of items, which include, wallpaper, fabric, embroidery or crewel samplers, craft books, tea sets, ceramics, canisters, tins, big eyed prints by Lee or Eve, pyrex, furniture, anything midcentury, kitsch or from the 1960’s/70’s really, the list is endless. Oh, I also find it impossible to resist anything with mod flowers on! I do have a vintage wish list, comprising of items I want and am searching for (some have been on the list for a while), but to my dismay I seem to add more to my list than I actually acquire. My favourite places to thrift are charity shops, jumble sales, car boot sales, flea markets and vintage fairs, but I also scour the internet regularly in the hope I may find an item on my wish list! I generally never buy anything unless it’s in good condition, however, I do love finding a great piece of vintage furniture, and I’m not perturbed by a little cosmetic damage as it gives me the opportunity to start a new restoration project. I’ve restored or up cycled the majority of my vintage furniture and I’m currently working on 2 beautiful Fleetway wall mounted cabinets from the 1950’s! As everyone is probably more than aware I LOVE CATS and this little mister has appeared on your feed a few times… TELL ME MORE! This is Cuddles, he’s grown somewhat since this photo was taken but he’s still just as adorable! I normally give my furry friends obscure names, but my son who was 18 months old at the time kept calling our new friend ‘Cuddles’ when we brought him home, so that’s what we named him! I also have a bluepoint ragdoll called Daddy Warbucks, and a rabbit that I named Elvis, as he has a quiff! You love to draw retro packaging. Are you inspired by any particular illustrators of days gone by or any particular manufacturers of packaging? 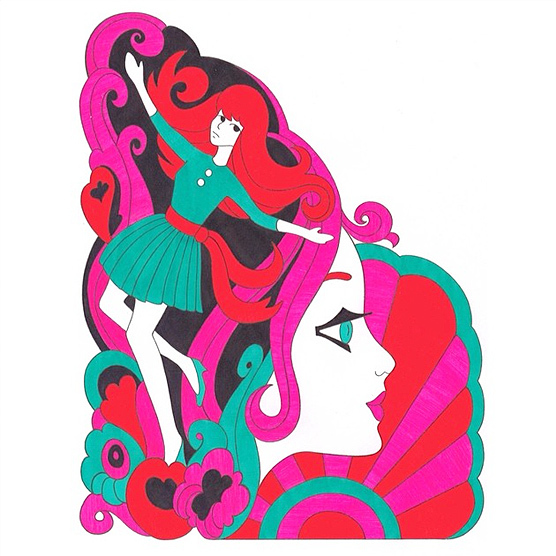 My love affair with the images and illustrations found on vintage packaging started at a very young age, and actually began with the record sleeves in my Dads vinyl collection. Of course I loved the music and fondly remember my Dad playing whole LP’s for me, but there was just something about the sleeves that enchanted me and kept me staring at them while sitting on the floor listening to the music, so I began drawing them. I think I have always just had a thing for packaging if I’m honest, I remember whenever I would receive a new toy as a child I always felt like I was ruining the item by opening the box and I’m still like it now with my Blythe. I’d always try to keep my boxes and packaging as a child and my parents were always telling me we didn’t have room and it had to be dis guarded. I suppose by drawing the images I felt like I was preserving the packaging somehow, and it’s not really any different to me drawing the images I find and like on vintage packaging now. I’m still trying to preserver the images somehow, only now its against time, rather then the rubbish man! Wow. Thank you Hollie! Isn’t she great? 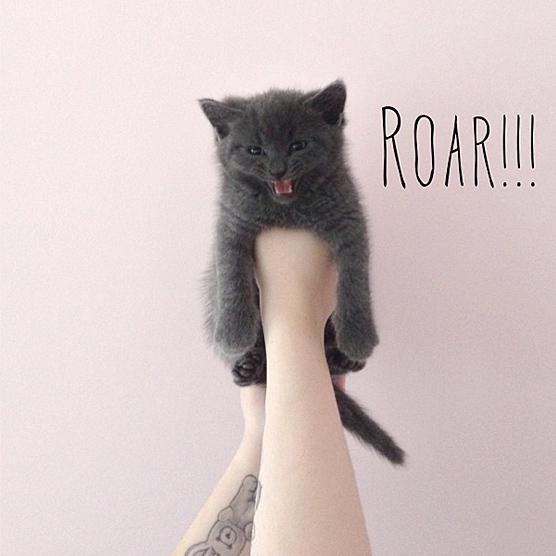 Go follow her wonderfully creative world of art, craft & vintage wonder HERE. Great article! Hollie and I share a love of retro goodness – as you can probably tell from the name!